Welcome to Muldoon’s Pub and Restaurant, an Orange County fine dining experience, nestled in the heart of Newport Beach, California. We have two distinct pubs under one roof, conveniently close to the excitement of Fashion Island. We are proud to have a large selection of beers, both on tap and micro brews, we also serve great mixed drinks, a large selection of wines, and fine whiskey. Join us for the fun bar scene we provide, from darts to appetizers, we are a great source of Newport Beach nightlife. "If you want amazing Irish/English flavors, please visit. The decor screams homey and the food is so hearty and filling. 'Bangers and Mash' is by far my favorite dish but I tried the Reuben, and let me tell you it was THE BEST I've eaten in my life." Muldoon’s ivy-covered double-brick building wins architectural awards because of our four unique spaces, including two distinct pubs, a beautiful patio and a charming dining room, all under one roof! The Dublin Pub is our 1st bar, built in 1974 entirely of oak, brick and brass, with our bulldog mascot stunningly rendered in stained glass. This is the spot for a game of darts! Lots of TVs to catch your favorite game! The Celtic Bar, added in 2000, is just across our patio and gives you the chance to go bar-hopping without leaving Muldoon’s! The perfect blend of rustic, industrial beauty! It’s truly ideal for booking your private parties! Lots of TVs in here for sports, too! 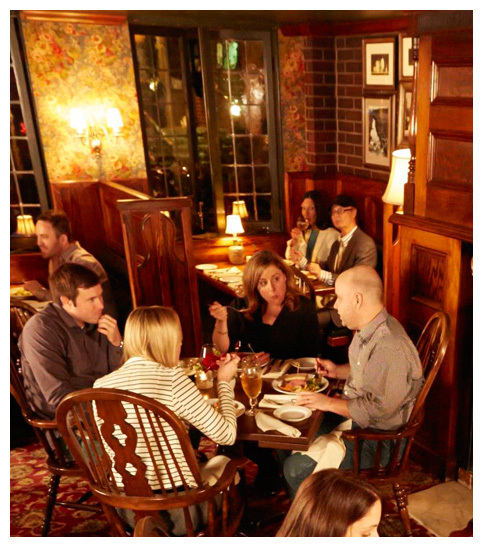 Our Tavern Dining Room, also built in 1974 from finely-crafted oak, is beloved for it’s real crackling fireplace, tall oak booths and hand-painted Irish proverbs along the coffered oak ceilings. It transports you across the pond, no passport required! These three indoor spaces form a circle around our open-air Patio, with a graceful Sycamore tree in the middle that gives shade and dappled sunlight, making it ideal for al fresco lunch, dinner, Sunday breakfast, watching sports and listening to live music!